Marcel Breuer was a renowned Hungarian-American architect, ranked among the most influential architects and scholars of the 20th century. Breuer has emerged as bold innovator, constantly experimenting with new forms, adopting newly developed technology and materials in order to create a masterwork complimenting the industrial age. He is considered as one of the prominent advocates of the International Style. 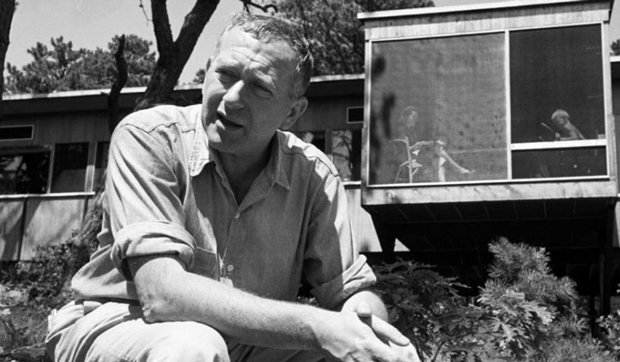 Marcel Breuer was born on May 21, 1902, in Pecs, Hungary. He moved to Vienna with his family at the age of 18. He attended the Art Academy to pursue his studies as a painter, however, very soon he became disenchanted and embittered with the eclectic approach and its various historical styles. After struggling to motivate himself for six months, Marcel gave up his intention of becoming a painter, and decided instead to learn a craft. He then enrolled at Bauhaus, Weimar, a recently developed school of design, building and craftsmanship. During the next four years at Bauhaus, Breuer devoted himself to the study of architecture, he was much inspired and influenced by Walter Gropius, the director of the school. Breuer showed the promise of architectural and artistic genius, and after proving himself a brilliant student, he was appointed the head of the furniture department. Breuer developed a profound interest in designing economical, useful and standardized modular-unit furniture, and in 1925, he designed his first chromium-plated, bent, steel-tube furniture. The same year, he moved to Dessau upon being commissioned to design the entire furniture for the recently constructed Gropius buildings. A notable work exhibiting Breuer’s experimental designs for this project is the S-shapes cantilevered chair of 1928, which has become, since then, one of the most commonly used commercial chairs across the globe. In 1928, Breuer established his own practice as an architect and interior designer, and located his office in Berlin. He began receiving numerous orders, and soon he embarked on building several radically innovative designs for private houses. In addition to that, he devoted his free time to develop and simplify unexplored theoretical frameworks, among which, he devised a plan for a hospital, and the design included a multi-storied building of concrete, supported by a series of cantilevered steps. In 1933, Breuer was forced to leave Germany, he moved to London, and began a lucrative partnership with F. R. S. Yorke. However, the partnership had to be dissolved only 4 years later, as Breuer accepted Gropius’ invitation to the United States. Gropius, who was serving as the chairman of the architectural department at Harvard University, facilitated Breuer in joining the faculty at Harvard. Breuer proved himself a remarkable teacher, he influenced a generation of young designers, and polished their talents to make them promising and operational architects. In 1940, Breuer was commissioned by Henry C. Chamberain to design a small vacation residence in Wayland, MA. Breuer employed the tactics of the Bauhaus style, such as the austere planar shapes that were enhanced with a wooden-frame exterior. During the 1940s, a startling and arresting feature of Breuer’s designs was the “butterfly roof” silhouette, which can be seen in the ‘Geller House’, Lawrence, New York. Following the WWII, Breuer shifted to New York City, and re-established his private practice. He was involved in several domestic projects, including his own house, the New Cannan, CT, which is famous for its remarkable wooden exterior. In 1953, Breuer collaborated with Pier Luigi Nervi and Bernard Zehrfuss to design the UNESCO headquarters in Paris. Marcel Breuer worked on numerous prestigious public projects, including dormitory at Vassar College, Poughkeepsie, NY; an auditorium for Sarah Lawrence College, Bronxville, NY; a church for St. John’s Benedictine Abbey, Collegeville, MN; a Research Centre for IBM-France; and the Whitney Museum of American Art, New York City, among many others. In 1976, Breuer decided to retire from active practice. He passed away five years later, in 1981.